If you like the idea of investing in real estate, but you don’t like the idea of being a landlord and the potential headaches associated with property management, you may want to consider investing in a real estate investment trust or REIT (rhymes with treat) or a fund that invests in REITs. A REIT is a company that owns, operates or finances income-producing real estate. REITs generate income through the collection of rent and from sales on the properties they own. Although some REITs are private, many are SEC-registered and publicly listed on an exchange. As an investor, instead of owning real property, you can buy shares of a REIT along with other investors, which means the REIT pools the money of investors together to buy and manage real estate. In this regard, REITs are similar to mutual funds, and shares can be purchased directly on an open exchange, through a brokerage account. REITs can be categorized broadly as either equity REITs or mortgage REITs and often invest in a specific area of real estate, such as shopping malls, hotels and resorts, and hospital property managers, or they may focus on one specific region, state or country. Most investors use REITs as income-producing vehicles, as they might with bonds or dividend stocks. This means that they are looking for consistent interest payments from their investment. For example, retired investors looking for income from their investments may be attracted to REITs. Since they are professionally managed, another advantage of investing in REITs is that you don’t need to know anything about real estate or property management to invest in it. The best way to access the REIT market for most investors is to buy a low-cost mutual fund or exchange-traded fund (ETF) that holds a diversified selection of REITs. Vanguard Real Estate Index (VGSIX) is the largest real estate fund on the market with more than $60 billion in assets. The portfolio consists of 186 REITs, all in the U.S., ranging in size from mid-cap to large-cap companies. Holdings range from hotel and resort REITs to industrial, health care, and office REITs. The fund is currently yielding 3.1 percent, and the expenses, at 0.26 percent, are lower than most REIT funds. iShares Cohen & Steers REIT (ICF) is an ETF that can be a smart beginning place to get broad exposure to the REIT market. Although many REIT funds invest at least a portion of assets outside the United States and in risky derivative investments, iShares Cohen & Steers REIT is an ETF that invests completely in long positions of large-cap U.S. REIT companies. This means that ICF is a fund that passively invests in the largest U.S. REITs for the long term. If you’re looking for income, the yield for ICF is 3.41 percent. Expenses for the fund are 0.34 percent, or $34 for every $10,000 invested. Schwab U.S REIT (SCHH) is one of the cheapest ETFs that provides diversified exposure to the U.S. REIT market. Expenses are a rock bottom 0.07 percent, or $7 for every $10,000 invested, and the yield for the fund is 3.42 percent. Low expenses are an advantage with all investments, because higher costs can erode at long-term performance and the income attributes of REIT funds. If you decide to invest in REITs, keep in mind that they have market risk like other equity-based investments. During extreme environments, such as the financial crisis in 2008, REITs can see declines of 30 percent or more. However, the long-term gains can still average near 10 percent, like stocks, while consistently producing above-average yields compared to stocks. This combination of growth and income can make for a wise addition to an investment portfolio. Also keep in mind that REITs derive their growth and income primarily from rental income. Therefore, when real estate properties are increasingly able to demand higher rents, income also generally increases. However, since REITs are income-producing investments, they can be sensitive to interest rates. This means that the current economic environment is mixed for REITs. Demand for rents is moderately high but interest rates are rising, which tends to put downward pressure on prices for REIT investments. You’ve probably also heard that real estate is all about location and local markets. This is mostly true. 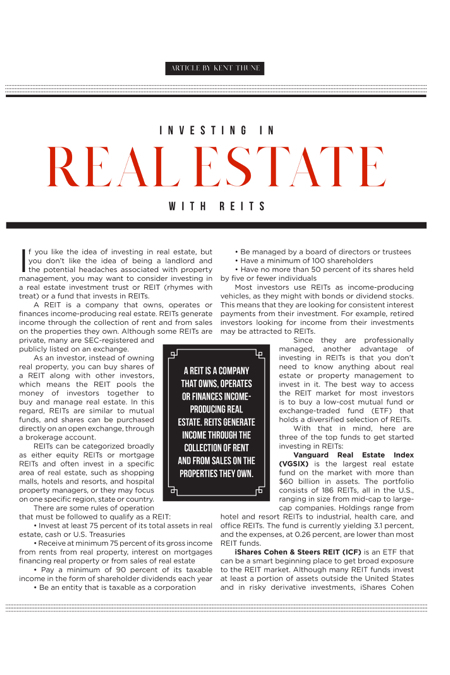 However, keep in mind that REITs are typically national and international in nature. But if your local real estate market is strong or weak, this does not necessarily indicate a strong or weak real estate market in general. To summarize, investors should not try to predict the economic environment or attempt to time their investments. REITs and the funds that invest in them can be a smart addition to a diversified portfolio that includes a range of other investment types. However, investing solely in one concentrated area of the market is almost never a good idea. If you choose to invest in REITs or REIT funds, a good allocation percentage is between 5 percent and 10 percent of your total portfolio. Kent Thune is a Certified Financial Planner® and is the owner of a Hilton Head Island investment advisory firm, Atlantic Capital Investments. He is also personal financial counselor to Marines and other service members on Parris Island. Thune’s financial guidance has been published at The Motley Fool, Yahoo Finance, Kiplinger.com, MarketWatch.com, Nasdaq.com, InvestorPlace.com, and his own blog at TheFinancialPhilosopher.com.